With an average of nearly 37.0% of the total value of B2B sales made on credit (not far from the 41.2% survey average), the Netherlands shows a fairly open stance to granting trade credit to business-to-business (B2B) customers. This does not differ from what was observed last year, and places the Netherlands between two distinct clusters of Western European countries. The first cluster includes Austria, Switzerland, Belgium and France (where the average value of B2B sales made on credit is notably below the survey average). The second includes Ireland, Spain, Great Britain and Italy (with an average B2B credit sales value that is more or less in line with the survey average). A third cluster includes Greece, Sweden and Denmark (with an average value of B2B credit sales well above the survey average). Dutch respondents show no strong preference for selling on credit to either domestic or foreign B2B customers. 39.9% and 33.9% of the total value of domestic and foreign B2B sales respectively were made on credit (survey averages: 44.8% domestic and 37.7% foreign). This reflects an almost uniform perception of payment risk arising from domestic and foreign B2B trade. This is common to the majority of the countries surveyed, except for those in Southern Europe (Greece, Italy, Spain), which seem to be more trade credit friendly to domestic than to foreign customers. In line with the survey average, around 88.0% of Dutch respondents experienced late payment of invoices by B2B customers over the past year. This resulted in an average of nearly 33.0% of the total value of B2B receivables remaining outstanding past the due date. This is below the survey average (nearly 40.0%). Late payment of invoices occurred almost equally as often with domestic customers as it did with foreign customers, and decreased by around 7.5% over the past year. This is likely to have resulted in an improvement in the cash flow position of businesses in the country. Late payment of invoices (domestic and foreign) is reflected in the Days Sales Outstanding (DSO) figure posted by Dutch respondents. This averages 42 days, and is five days longer than last year, and is notably below the 48 days survey average. This may reflect greater efficiency in collecting high value long outstanding invoices than in most other Western European markets. Nearly 75.0% of respondents in the Netherlands expect no change in DSO over the next 12 months. As collection of outstanding invoices implies costs to pursue the debts, cost containment appears to concern Dutch respondents (27.7%) almost as equally as it does respondents in Germany (27.3%). On average it is a concern of 23.4% of respondents in Western Europe. Payment terms extended to B2B customers by respondents in the Netherlands average around 27 days from the invoice date, and are not markedly far from the survey average (31 days). Domestic and foreign terms differ by only three days, reflecting the already mentioned uniform perception of payment risk arising from either domestic or foreign B2B trade. Over the past year, payment terms did not vary markedly, which highlights a consistent payment culture in the country. Despite no marked year-on-year change in payment terms, B2B customers of Dutch respondents settle overdue invoices, on average, within two weeks past the due date (survey average: three weeks). This is one week earlier than last year. This means that it currently takes respondents in the Netherlands an average of around 40 days from invoicing to turn past due receivables into cash (well below the 53 days survey average). This is in line with what was recorded in Austria, Sweden and Denmark. In the Netherlands, the most often reported reason for late payment of domestic and foreign B2B invoices is customers’ liquidity issues. More respondents (57.3%) than last year (51.0%) reported this for late payment from domestic customers. Slightly fewer respondents (45.3% this year compared to 48.1% one year ago) reported this payment delay factor in respect to foreign invoices. Customers’ intentional use of outstanding invoices for financial advantage is the second most often cited reason for late payment of B2B invoices (34% respondents in the Netherlands, versus 27% in Western Europe). 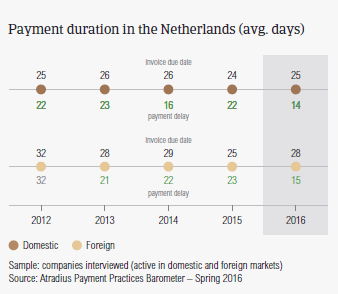 Dutch respondents believe this occurs more often in respect to domestic than to foreign late payment. However, with foreign payments, it appears to happen for this reason more often than last year. Late payment from foreign customers is also reported to frequently occur due to complexity of the payment procedure (30.0% of respondents). Nearly 57.0% of Dutch respondents reported no significant impact on their business as a result of late payment of invoices by customers. This suggests a firm grip on account receivables management. Despite this, nearly 20.0% of the respondents (23.7% in Western Europe) had to delay payments to their own suppliers. This is one of the reasons why, nearly one in four respondents plan on requesting secured forms of payment more often this year. Around 20.0% will check their customers’ payment history and monitor their customers’ credit risk more often. The proportion of B2B receivables reported by Dutch respondents as uncollectable (0.8%) is notably lower than the 1.3% average for Western Europe. Domestic uncollectable receivables were written off almost as often as foreign ones. Uncollectable domestic B2B receivables originate most often from the construction, consumer durables and business services industries. 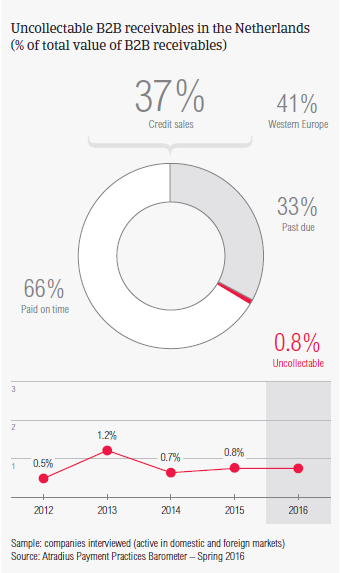 For more respondents in the Netherlands (66.0%) than in Western Europe (59.3%), B2B receivables were uncollectable mainly due to the customer being bankrupt or out of business. At the same time, more Dutch respondents (27.4%) than overall in Western Europe (25.6%) reported that write-offs were mainly due to the fact that the additional costs to pursue the trade debtors were too high, particularly on export markets. Survey respondents in the Netherlands reported granting trade credit terms mainly to B2B customers belonging to consumer durables, construction, business services and overall services industries. Invoice payment terms extended to B2B customers in the financial services industry are significantly above the country average (averaging 40 days from invoicing). B2B customers in the consumer durables sector settle past due payments the quickest (around one week past due). An above average (for the country) proportion of overdue invoices was generated by the construction industry. According to most of the respondents (62%) this is likely to be chiefly due to liquidity constraints of customers in this industry, who deliberately use outstanding invoices for their financial advantage (as reported by 52.0% of respondents). Around one third of the respondents in the Netherlands expect payment practices of B2B customers in the food industry to deteriorate slightly over the next 12 months. No significant change is anticipated in respect to payment practices of other industries.